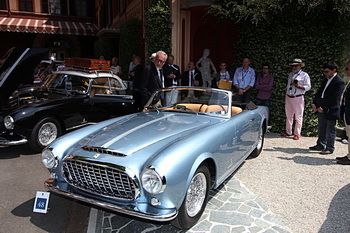 Another restoration by Ferrari Classiche debuted at the Villa d’Este Concorso d’Eleganza; a 1952 212 Inter Cabriolet, it is historically significant as it is only the second car ever to have been built by Pinin Farina. 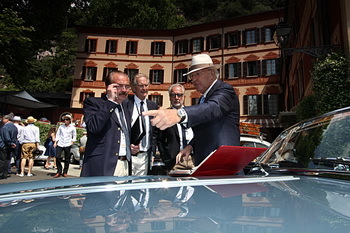 Another restoration by the Ferrari Classiche department debuted at the prestigious Villa d’Este Concorso d’Eleganza over the weekend on the shores of Lake Como. The car, a 1952 212 Inter Cabriolet (chassis number 0235EU), is historically significant as it is only the second car ever to have been built by Pinin Farina who went on to become Ferrari’s coachbuilder of choice. The 212 Inter Cabriolet was first shown to the public at the Paris Motor Show in November 1952 before being sold to its first owner, Tony Parravano of Rome, by the then US importer, Chinetti Motors. In August 1953 the car was famously entered at the Nürburgring 1000 km by film director Roberto Rossellini where it was driven by Maurice Gatsonides – the Dutch racing driver best known for inventing the Gatso speed camera – and Riccardo Vignolo, to finish an incredible 9th overall. Now in the hands of American Ferrari collector, Kenneth B. Roath and his wife Dayle, the matching-numbers 212 Inter Cabriolet was returned to Ferrari in the autumn of 2010 for a complete and meticulous restoration in its original Azzurro over beige livery using both the factory’s archives and period photos. The department was set up in 2006 to provide owners of classic, veteran and historic Ferraris with dedicated maintenance, repair and renovation services, technical assistance and authenticity certification. So far over 3,300 certification requests have been processed. The certification process involves researching the original designs of the historic Prancing Horse cars held in the Company’s own Archive which houses details of all of the GT, competition and sports prototype cars built by Ferrari since its foundation. Any work done on the cars is carried out in compliance with those original designs. In all, 55 full restorations have been carried out in Ferrari Classiche’s dedicated workshop.